And for my final post today from Hong Kong, check out this exposed section of the Shing Mun Tunnel in Shatin. 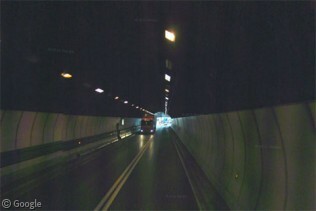 This tunnel links between the eastern and western part of the New Territorries, which are separated by mountains. Many thanks to Philip Ng. Completely off topic, but can anyone help me to explain the perspective of the building right in the center of this view? Is it the strance shape of the building? Is it a remapping error? Cool tunnel, sure – but you’ve got to check out this mind boggling highway in the South of France / Northern Itay. I haven’t even tried counting the number of tunnels here but it truely amazing. Has anybody driven this stretch of roadway? Speaking of French highways, has anybody found the Millau Viaduct? The buidling is actually quite high, so the strange perspective is understandable. @fihu: thanks a lot. geez, now i remember this building. it looked totally different in the google sight. and it is not rectangular shaped, which i firstly assumed and led me to a really strange extrapolation. reminds me of those pictures (of Escher?) which flip their perspective depending on what you conentrate on. I think the illusion of bizarre perspective makes that building worthy of its own entry. Is this the start and end of an even bigger tunnel in the same region? has anyone noticed how empty the streets and highways seem there? This is the first time I have visited the website and I can see the tunnel from my window! Coincidence? Just curious, why is this linked to maps.google.ca instead of maps.google.com?